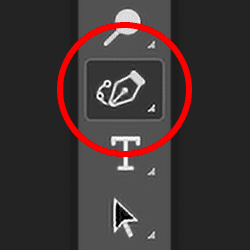 Upgraded to Photoshop CC 2018 but can't find the Curvature Pen Tool in the Toolbar? Chances are it's because you're using a custom workspace. This tutorial shows you how to find and restore the missing Curvature Pen Tool using the Customize Toolbar feature in Photoshop. In a previous tutorial, we learned how to use the brand new Curvature Pen Tool in Photoshop CC 2018 to easily draw shapes and paths. Normally, the Curvature Pen Tool is found with Photoshop's standard Pen Tool in the Toolbar. But if you've upgraded to CC 2018 from an earlier version of Photoshop, and you're using a custom workspace that was created in that earlier version, you may not see the Curvature Pen Tool listed anywhere. That's because Photoshop CC 2018 does not automatically add the Curvature Pen Tool to your custom workspace. To use it, you'll need to add the tool manually. In this quick tutorial, we'll learn how to restore the Curvature Pen Tool using the Customize Toolbar feature in Photoshop. Let's see how it works! 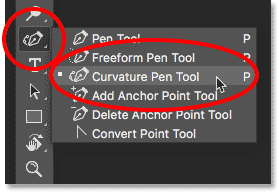 As with the previous Curvature Pen Tool tutorial, this one is only for Photoshop CC 2018 users (or later if you're reading this in the future). If you're an Adobe Creative Cloud subscriber and have not yet updated to Photoshop CC 2018, see How To Keep Photoshop CC Up To Date for everything you need to know. Let's get started! Using a custom workspace from a previous version of Photoshop. The Curvature Pen Tool is missing from the list. Clicking the "Edit Toolbar" icon. Choosing "Toolbar" from under the Edit menu. The Customize Toolbar dialog box showing the Curvature Pen Tool as an Extra Tool. Drag the Curvature Pen Tool from the Extra Tools column into the Toolbar column. The Curvature Pen Tool has been added to the current Toolbar layout. The Curvature Pen Tool now appears in the Toolbar. And there we have it! 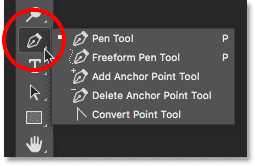 That's a quick tip on how to find and restore the missing Curvature Pen Tool when you're using custom workspaces in Photoshop CC 2018! Be sure to check out our Curvature Pen Tool tutorial to learn all about this great new feature. Or visit our Photoshop Basics section for similar tutorials!